Population of Nigeria in 2100: 1 billion Nigerians. Africa: emerging continent or next “frontier market”? Nigeria: world's first frontier market. 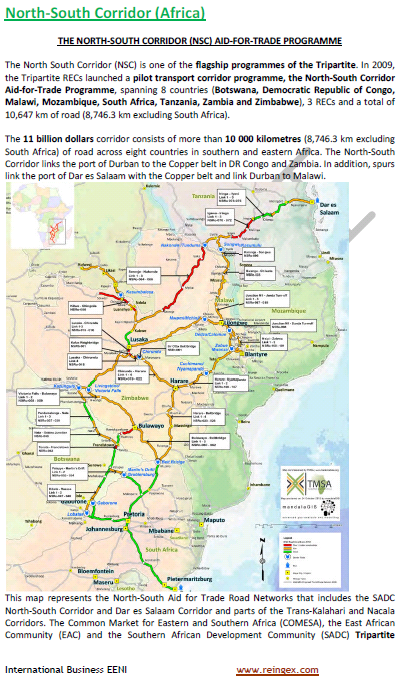 African Union vision: to increase intra-African trade up to 25% (currently 10%) through regional integration. 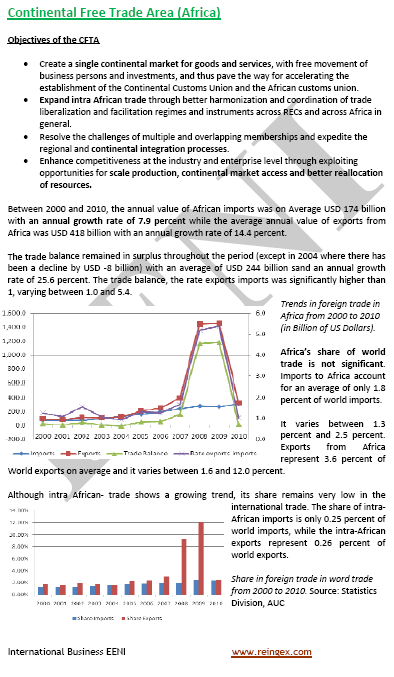 The action plan to stimulate intra-African trade. The ultimate objective is to create the African common market “The African Continental Free Trade Area (CFTA)” (one billion people, a combined GDP of $ 1.2 trillion) made up of fifty-four African countries. African products have an “EXW” competitive cost, but the distribution process in Africa (transport and logistics, handling, customs, stockage...) increases the final price generating a loss of competitiveness. One - stop border posts can help to reduce the custom's clearance times on African borders. For example, on the border between Uganda and Kenya (Malaba), the border crossing has been reduced from 24 hours (2011) to 4 hours (2012). Financial systems in Africa are limited and not sufficiently regionally integrated, resulting in high transaction costs and high levels of risk. One of the pillars of the African financial system is the cross-border banking sector. 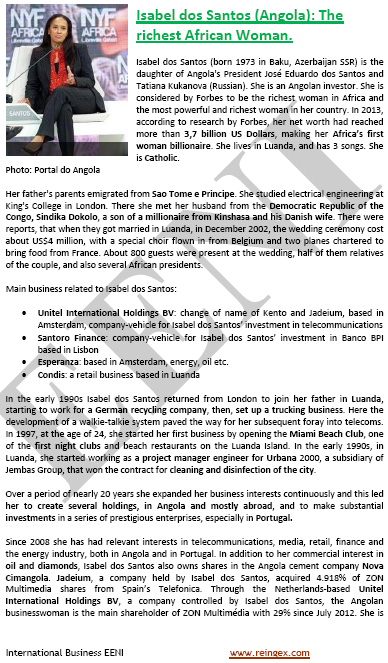 Africa, the factory of the world? Asia is Africa's third largest export market (26% of total African international trade). The main exports are commodities. 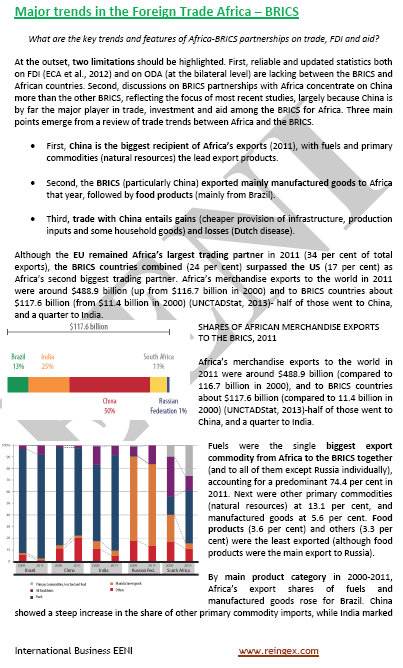 China is the first export market of Africa (50% of total African exports: fuel and natural resources). China is the first investor in Africa. Fifteen African countries do not have access to the sea: Botswana, Burkina Faso, Burundi, Chad, Central African Republic, Ethiopia, Lesotho, Malawi, Mali, Niger, Rwanda, Swaziland, Uganda, Zambia and Zimbabwe. 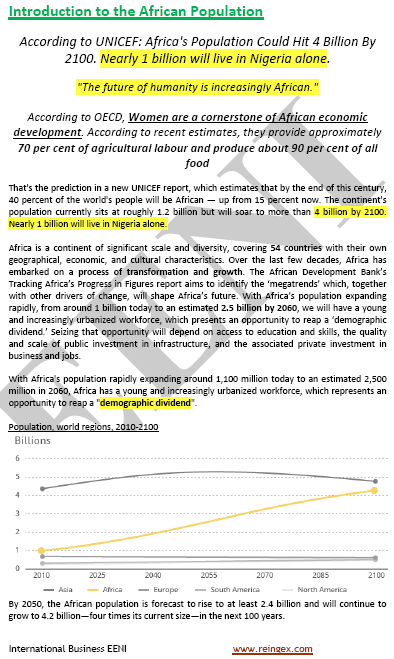 Africa needs 93 billion dollars (15% of Africa's GDP) in infrastructure investments.